I can honestly say that I probably would not have picked up this book if I hadn’t seen the movie trailer earlier this past summer. I knew I had to read it first because that’s how I prefer to do things; read it, then see it. 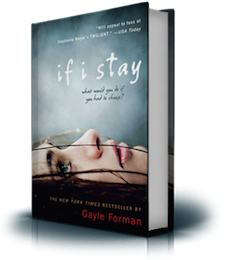 If I Stay is a new story of life and death, and what happens if someone has the chance to choose. Seventeen year old Mia is placed in a position to make the decision to live or die after she and her family are in a fatal car accident as she remains in the ‘in-between’ stage where she can see everything happening to those she’d leave behind if she chooses to die. Part of her wants to stay, for her best friend, boyfriend and the rest of her family, but on the other hand she wants to leave them so she can join her parents and brother who died in the crash. As Mia contemplates her decision she shares memories of the people she loves so that we learn more about Mia and the other characters. I found this to be similar to the novel The Lovely Bones by Alice Sebold, only in that book the main character had no choice to live or die. What I found to be better about this book though was that there was a pattern to the writing. Mia would narrate what was going on in the present, with her body in ICU and her family in the waiting room, then she’d make a transition to a memory of a certain person or event, which you knew as coming with a page break. I also found it interesting that there were no actual chapter numbers, but rather each chapter was set with different times during the day as the events unfold. Over all though, it was a great book as you read and wonder what will happen at the end. I actually predicted how the story would end, which surprised me because when I do that I’m usually never right. However, the idea for this story is so original and it makes you wonder, if you were in Mia’s position, what would you choose? To stay with those still living or join your parents and siblings in death? Now that I’ve read the book, I’m very excited to see the movie and read the sequel! From your entire post it seems quiet clear that; you must be having great fond of reading books. Yes, reading book should be the favorite hobby of every one; because as a popular saying books are best friend; and it is true too; because, it never leaves you alone, it never complains about any things, it never demands anything from us and best part; it never demands our time; so; it is we who can decide that when this friend should be called and when not. Thank you. And yes, I am very big on reading personally. It’s always a nice escape for me. Hello Tabitha! I’ve decided to read and follow 15 interesting and new blogs a day every day for the first month of 2015, and yours is today’s #14! Feel free to come visit me when you can at http://www.thatssojacob.wordpress.com, and follow if you like what you read. Happy new year and happy blogging! Thank you and I have followed already. Happy blogging to you as well! The movie made me cry like a baby… full blown tears. I’m so excited to learn that there will be a sequel! It also made me realized how badly I want a musician in my life… as a significant other I mean. Oh great, another movie that will make me cry! Haha. At least I know it’s good! I loved the book, but the movie was not my favorite. I never ended up reading the sequel, you should post a review of the 2nd one when you read it! If you like it, maybe I’ll end up reading it. I will be reading it soon and I definitely will post a review.